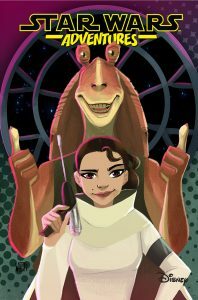 Padmé Amidala joins Jar-Jar Binks on a quest to recover a legendary Gungan artifact. Uh oh! This one is going to be very messy! Plus, Gannis Ducain details his time with the Millennium Falcon! 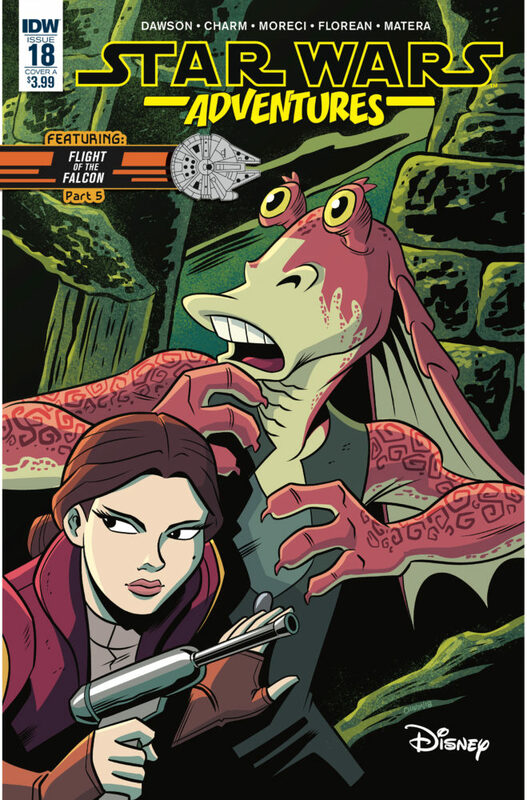 Issue 18 opens with a Delilah S. Dawson penned Jar-Jar Binks and Padmé Amidala adventure Raiders of the Lost Gundark. Together they set off to find a Gungan treasure, the Blobball. As the title implies, it’s told in an Indiana Jones-style; fraught with precarious rope bridges, serpent-like slitherfish, and spelunking the underworld of Naboo. However, when our heroes find their Golden Idol, they must flee from a gigantic Gundark rather than a thundering boulder. It’s certainly a fun and entertaining ride.In the fifth chapter of the Flight of the Falcon series, the tale brings us up-to-date with the events that enable for the Falcon to turn up in the hands of Unkar Plutt. Bounty Hunter, Bazine Netal, interviews Gannis Ducain, the Nikto busboy turned infamous gunrunner. Gannis relates the story on how he absconds with the Millennium Falcon shortly after being hired on by Han Solo. Having done so allows him to a life faster than the Falcon herself. However, he just as quickly burns out and finds himself “tied to the end of a string” by the First Order and the Millennium Falcon stolen right from under him. 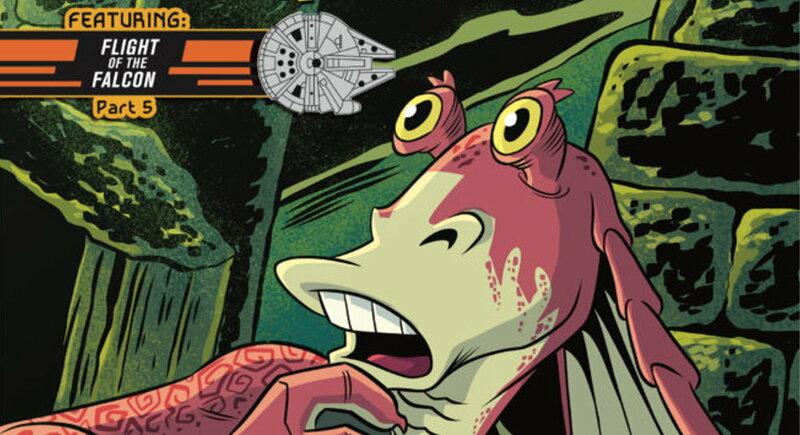 The Star Wars Adventures series continues to be one title I look forward to reading every month. I am not the only one for when I offer Wednesday’s titles to my son, it’s always his first choice. 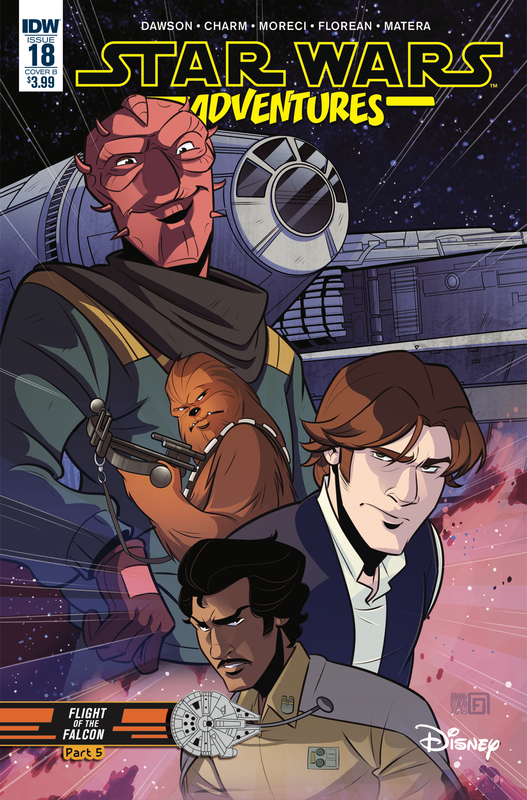 IDW Publishing’s contribution to the Star Wars Universe has continued to evolve and reminds us just how the possibilities to tell stories from that far away Galaxy are endless. Raiders of the Lost Gundark is Delilah S. Dawson’s third contribution to the Star Wars Adventures series (plus one to Forces of Destiny). It’s a fun tale and it’s anticlimactic ending (just like in the film) makes it a delightful homage to George Lucas’s other universe. Derek Charm’s artwork reflects the light-hearted comedic spirit of the story. Derek’s art has been a perfect match for the entire Star Wars Adventures series. Grand Theft Falcon is the next-to-last chapter in The Flight of the Falcon. It certainly has been an enjoyable ride with Michael Moreci as he pulls in the historical threads of our favorite starship. 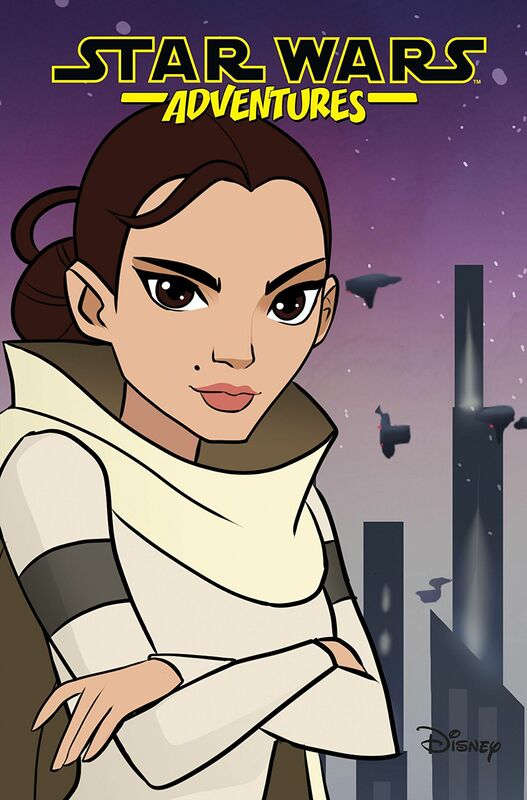 This time he fills in some of the blanks on the series of hands the Falcon has been passed through since we last saw her in Return of the Jedi and wound up on Jakku. It will be interesting to discover Lady Proxima’s role in the conclusion of the story in the next issue. The creative team led by Arianna Florean delivers the story distinctively from the previous but just as reflective of the energy as Charm’s style. Again, just another example of the wonderful package contained in each issue. I am looking forward to collecting this series in the trade paperback which is scheduled to be released in July. That gives me time to catch up on the series’ prose that I have been neglecting.